STATE COLLEGE – The Chamber of Business & Industry of Centre County (CBICC) and its young professionals arm – CBICC Connect – announce the launch of a new initiative designed to encourage more residents to serve on local authorities, boards and commissions. 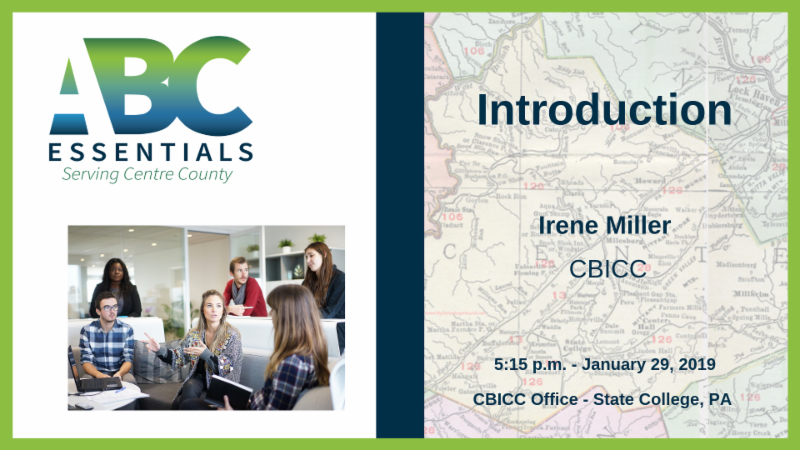 ABC Essentials will kick off at 5:15 p.m. Tuesday, Jan. 29, with an “Introduction to ABCs” presentation at the CBICC offices, 131 S. Fraser St., Suite 1, in State College. ABC Essentials will offer a series of monthly, hour-long presentations designed to explore the many authorities, boards and commissions that are responsible for guiding municipal, county and regional decisions. In a casual setting, attendees will have the opportunity to learn more about a particular ABC; better understand the role of/expectations for volunteers; and have their questions answered. Municipal officials and those currently serving on an ABC will serve as presenters. “The decisions made by various boards and commissions impact the quality of life and the economy in individual communities, and ultimately, the county as a whole,” said CBICC President and Chief Executive Officer Vern Squier, CCE, PaCCE. Ferguson Township Manager David Pribulka said participating on a local authority, board or commission is a great way to contribute to the betterment of your community in a meaningful and rewarding way. State College Borough Communications Specialist Douglas Shontz agreed. “Every volunteer that is selected to serve on the borough’s more than 20 ABCs is an important factor in the borough accomplishing its mission to enhance the quality of life by fostering a safe, vibrant, diverse and sustainable community,” Shontz said. Pribulka stressed that being an expert in the area you are volunteering is not a prerequisite. “All that is required is a passion for your community and a desire to contribute,” he said. To that end, ABC Essentials also seeks to strengthen the comfort level of those who might desire to contribute to their local community in this manner, but have been hesitant to do so. “Local government is where the rubber hits the road, and good decisions cannot be made without the thoughtful input from dedicated volunteers on each of these committees,” Pribulka said. Squier encourages Centre County residents to attend one, some or all of the ABC Essentials presentations, all of which will be held at 5:15 p.m. in the CBICC offices, and will include light refreshments.